since in New York white doesn't last white for a mere second! My husband has to be all dressed up for work. ...Which means a lot of crispy whites. and because he travels all over the world, he finally found a great tailor in India that makes him gorgeous suits and shirts at a fraction of the price (I believe I gave my husband the 'bargain bug', yup it's that contagious). Once a year, he has a bunch of shirts made and he comes home with a lot of tiny pieces of fabric scraps... in my world this means party time!! 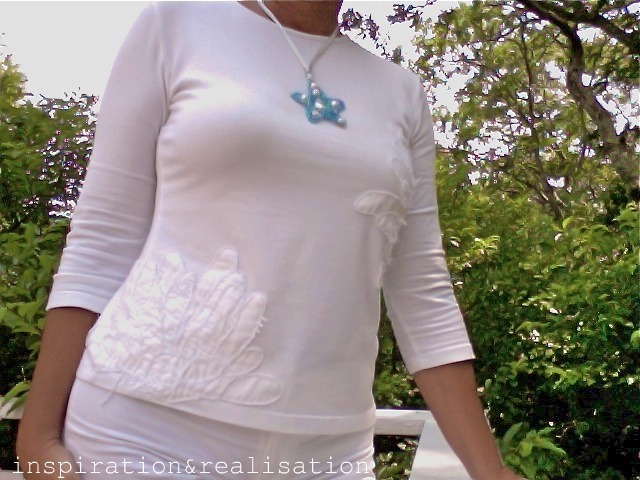 I made this shirt with some of the white scraps, taking the inspiration from the J.Crew "Mum Applique Art tee".. Looking at the J.Crew detail, I cut a lot of shapes that sort of looks like pieces of an anemone, and hand stitched overlapping them over the t-shirt with a light grey thread. I have two of these 'anemone' shapes: one on the bottom side and one placed vertically on the other side, just next to the arm. I didn't fray checked the pieces, so now that the shirt has been washed several times, all the fray edges are showing off ... love it!! I swear, I wish I could crawl around inside your brain. You are so stinkin' talented, I wish you lived closer so I could give you free reign to dig thru my closet and remake a bunch of unworn stuff. Love it as always. What she said. I totally agree. I wish you could go through all my precious scraps and tell me what to do with them. And I now understand you comment about wearing white in New York. Lucky you in Martha's Vineyard. bello fare shopping in tutto il mondo! Mi immagino la scena: programmi per oggi? Great refashion! Lucky you getting scraps from India!! How exciting! Very cool! I like your version better too! 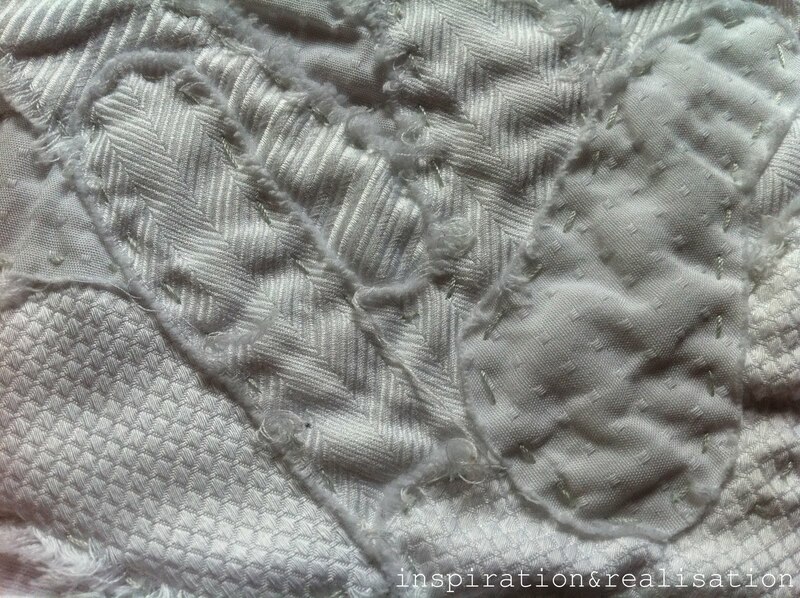 The textures and fraying are gorgeous. Super cute. You have such creative ideas, especially when it comes to repurposing/copying clothes. Thanks for the inspiration! Very clever! You come up with the best designs. So pretty! And inventive! Great blog, am a new follower! How lucky you are to be in Martha's Vineyard and to have those fabulous hand me downs from hubby!!! I love the t-shirt and I am intrigued by your necklace too! Did you make it? ?I am visiting you from Homework's Inspiration Party.I would love for you to link it to my Pinkalicious Thursday party. Lovely idea and shirt! The look is so trendy right now, I would have never thought of making my own! I came over from the creation corner link party! Beautiful! Love the detail you showed of your work. Awesome. Have a great day! So nice! I love that your husband thought to bring you the scraps!! Awesome!! You seriously need to start selling your work! That's such a great idea. I really like how your shirt turned out. That looks so cute! I can't wait to try it! We would love for you to share this at our link party and come enter our free digital scrapbooking software giveaway!